As in many parts of the world, concrete tanks are used in Nepal to store water for human consumption. 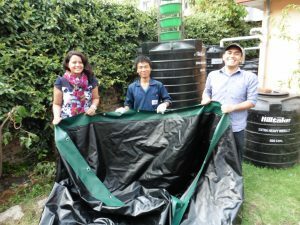 During the latest earthquake in 2015 however, many of these water tanks were damaged: walls cracked open and the collected precious water leaked away. 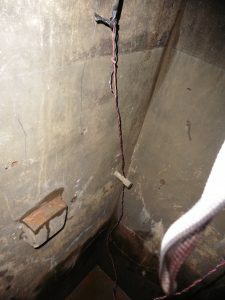 Normally it is difficult to repair these concrete tanks. Cracks are difficult to allocate and how do you prevent the cracking process to carry on?. Therefore, repairs are often just an expensive temporary measure leading eventually to the construction of a new concrete tank. Building a new water tank will–apart from the hassle and time it takes to rebuild- pose a major financial loss to the organization. AAWS has developed a new way to overcome the high cost of rebuilding concrete tanks and reviving the existing concrete the cracked concrete tank completely: the TankCAP. The TankCAP is a foil structure, tailor made for each individual tanks, and is located on the inside of a damaged concrete tank to cover the inside walls completely. 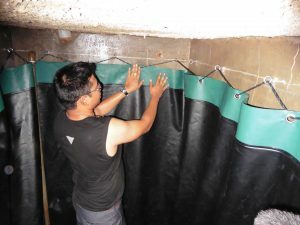 The foils used strong, 100% leakage free, flexible and preventing water to leak out of the tank from the moment of installation. Small fissures and cracks will no longer cause problems and the concrete tank can be used for another decade without problems. 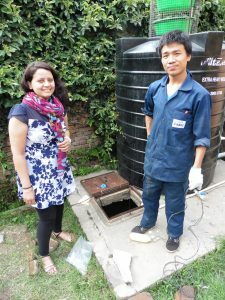 The pictures next show the installation of a TankCAP in Kathmandu, Nepal were a fractured water tank was revived in a matter of hours. Simple, easy and effective. Interested to find out if we can help you reviving your leaking concrete water tank? Let us know and we are more than happy to inform you about the possibilities.